FRESNO, CA (KMJ) – Murder — spiking the latest crime trends in Fresno. Violent crime is up slightly year to date, date almost 2 percent, mostly aggravated assaults. 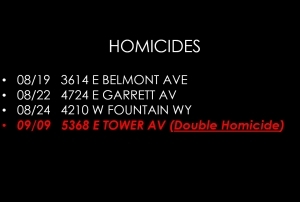 Homicides were continuing a downward trend, 29.3% percent decrease in overall murders in Fresno, but in the last 28 days, five murders took place making the numbers reverse, one involved gang members, two were due to a family disturbance that ended in murder. There were only 17 shootings in the prior crime view period, but that figure jumped up to 22 shootings over last 28 days. 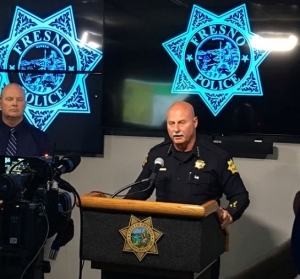 On average there was just one shooting per day this year, and Fresno’s Police Chief Jerry Dyer said in 254 days there were 252 shootings, YTD, compared to 365 in 2017. “A significant reduction of 29%, and that means there’s 104 fewer shootings that occurred here this year, in the city of Fresno than occurred last year, a significant reduction, and we know the vast majority of those reductions are within gangs,” said Dyer. Chief Dyer said the other reduction was the number of gunfire victims, 168 this time last year, that’s been reduced to 104, a 38% reduction. “64 people that did not have to go to the hospital for treatment.” said Dyer. As for property crimes, Dyer says overall property crimes which impact most residents are trending down 16.8% a significant reduction. Residence and business burglaries were down 28%. Vehicle burglaries and auto thefts were lower than in years past, there was 23% percent reduction in vehicle burglaries – however police saw an uptick – 30% in last 28 days. The same holds true for auto theft – even though numbers were down this year 21.8 % – but up 19% in the last 28 days. Fresno police are dealing with homeless and gangs taking over parks, leaving needles and threatening residents. Theft at fitness centers was an issue, said Dyer. 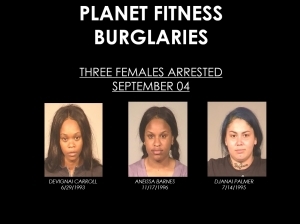 Dyer said three women from Oakland had bought a day pass and used bolt cutters to cut locks and steal credit cards and items from lockers at Planet Fitness in two Fresno locations before they were caught after a fitness center manager called police. The trio allegedly used the stolen key fobs to break into cars in the parking lots. Police apprehended the women in a parking lot of the Planet Fitness in Northeast Fresno on Barstow and First. Dyer said the women had purchased gift cards from CVS, and when they were caught police seized the gift cards and found information on their cell phones about committing the crimes. All three have since bonded out of The Fresno County Jail. Dyer says they are seeing a trend of criminals traveling up and down the 99 Freeway corridor to commit crimes. License plate thefts are still a problem, with the Chief advising people to secure the plates or score the renewal tags, which are selling for $25 bucks a pop.